Do You Have The ‘Sewing Bug’? A home seamstress or tailor – as opposed to some sort of drainage for waste??!!! I used to be when I was a teenager and in my early teens. I made quite a lot of my own clothes. Some well and some quite badly. As my author Mum (Alanawoods.com) will attest! 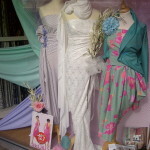 I often pop into the local sewing store for a few bits and bobs and I always stop to admire their window display. 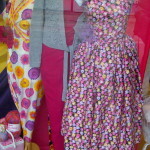 The shop is manned by a group of grey haired grannies – but boy, do they know how to do some great windows! This entry was posted in Sewing and tagged how to parent by Mamasim. Bookmark the permalink.